Maui is known all over the world as one of the best places to snorkel, but even among these great spots there are some that are considered the absolute best. 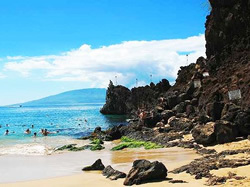 Whether you’re going snorkeling in Maui for the first time or are an experienced diver, there’s a Maui snorkel spot that’s sure to blow you away. 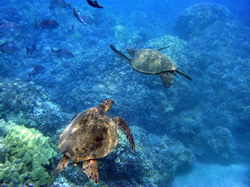 We’ve put together a list of what are widely considered the Best Maui Snorkeling Spots. All of them are known for clear waters, beautiful coral formations and an abundance of sea life. Once you snorkel Maui, every place else will pale in comparison and once you’ve snorkeled one of these breathtaking spots, you’ll never want to leave. Molokini Crater is considered one of the best snorkeling spots in the world and the best Maui snorkeling location. Molokini is an underwater volcanic cinder cone and a snorkeling site like no other. The island it has become is named as a Marine Life Conservation District Seabird Sanctuary, but it’s the abundance of colorful fish and wildlife below the water that will amaze you. The water surrounding Molokini Crater is incredibly clear, even at depths of up to one hundred feet, allowing you a perfect view of the tropical fish, manta rays, monk seals and harmless white tip sharks and whale sharks that are commonly encountered. Molokini Crater is about three miles off the coast of Maui, so it’s only accessible by boat. Molokini is suitable for everyone, from novice to expert, but no one who dives it will ever forget it. This snorkeling spot in Maui has something that not many others do: one of the densest populations of Hawaii’s beloved sea turtle. Located on the southern coast of Maui, between Nahuna Point and Block Sand Beach, Turtle Town is home to many varieties of fish and sea life, but it’s the turtles that people come to see. It’s an amazing opportunity to encounter these large, graceful creatures up close. This snorkeling spot is a good one for families with children or beginners. 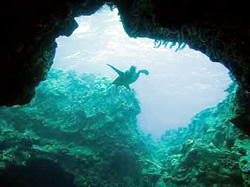 Five Caves is considered one of the most unique Maui snorkel spots for more advanced snorkelers and scuba divers. It’s quite a swim from the beach, so is recommended only for those at an intermediate or better level, but it’s well worth the swim, with abundant sea life and plenty of underwater caves and swim-throughs. 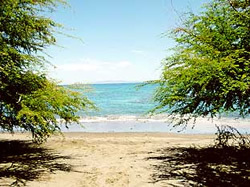 Located south of Wailea on Makena Road, the beach is not visited heavily and has no facilities. 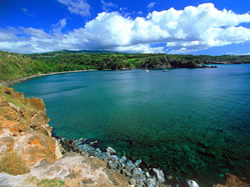 This Maui snorkeling area is a favorite for its accessibility and acres of coral reef. It’s about ten miles south of Lahaina on Hwy. 30 and almost any spot off of the beach is a good one for snorkeling. The water is shallow and calm for quite a way out. This makes it a good snorkeling choice for beginners on their own or for those that haven’t snorkeled in a while. Coral Gardens is located in the center of the western Maui coast. One of the things it’s known for is its amazing coral formations as well as its huge population of colorful fish. Between December and April, you may even be fortunate enough to spot a humpback whale. Coral Gardens is recommended only for more advanced snorkelers, as it’s quite a swim from the beach, located near Pali. 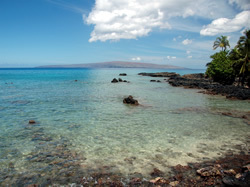 Located south of Wailea, the Ahihi Keanau Reserve is a great place to spend a day of snorkeling on Maui. The bay itself is a good place to get used to snorkeling if you haven’t done it before and there are plenty of good spots all along the beach, so this is a good snorkeling destination for families. The beach is rocky and there are no facilities here, so be prepared. Located in front of the Kea Lani Hotel, between Wailea and Makena, this is a sandy beach with good facilities, making it a favored spot for families who want to spend some time relaxing on the beach as well as get in some good snorkeling in Maui. 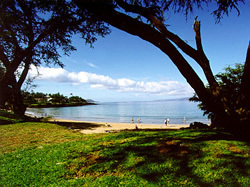 At the north end of Ka’anapali, Kahekili Beach Park(also known as Airport Beach) is another good snorkeling area for families, as the beach is sandy, the water is calm and there are facilities available. 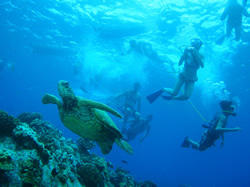 The abundance of coral reef makes it a popular spot for scuba and snorkeling instruction as well. Black rock is more of a wall dive than snorkeling spot. It’s a lava outcropping with plenty of attached coral, making it a unique spot for beginner to intermediate divers and snorkelers. It can get rough and murky if there are some good swells, so use caution. It’s also a nice sandy beach with quite a bit of parking and good facilities available. Honolu’a Bay is considered one of the best snorkeling beaches in Maui, but you do have to get there in a good day, as swells can make the water too murky and a bit rough for snorkeling. This is a marine reserve, so there are plenty of colorful fish and occasionally a few turtles show up as well. The beach is smooth rock, so it’s not the best place for a day at the beach if you want to do anything other than snorkel. This location also has no facilities, so bring what you need. No matter where you choose to spend your Maui snorkeling time, you’ll want to bring an underwater camera to capture the amazing sea life and coral reef formations. Be sure to bring plenty of sunblock and water with you and if you’ll be somewhere without facilities, you’ll want to pack a lunch as well.